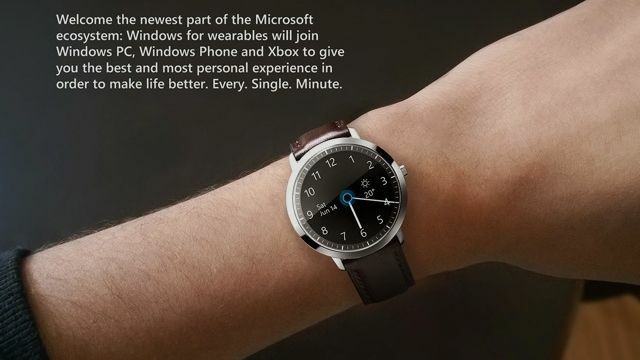 Details on Microsoft's long-rumoured smartwatch are thin on the ground but these concepts are an encouraging glimpse at what could be in store for a Windows-wielding timepiece. The faux-watch mock-ups come courtesy of designer Nadir Aslam, and show off a spiffing wearable brimming with juicy tech and features. The round watchface offers up the time (duh), the date, weather details, and will also display a variety of other apps like Messages and Xbox Music. It's also got a familiar blue circle embedded in the design that signals Cortana integration. In terms of sensors, Aslam's imaginary wrist-hugger comes touting a heart-rate monitor, a GPS, a gyroscope, and a galvanic skin response sensor. Looks as though popular public opinion is shifting towards a wearable beauty pageant over in Silicon Valley, with clunky square-faced watches failing to capture the hearts of the masses. Motorola's Moto 360 sports a similar round-faced design, and a mystery smartwatch from HP takes luxury wearables to the next level with the most beautiful teched-out timepiece we've seen so far. As always, you can check out the latest chatter on Microsoft's mystery timepiece over at our rumour round-up page.